I decided to attempt a couple of new recipes for Thanksgiving (I like adding a little suspense). One of them was this recipe for yeasted rolls. Yeasted you say? Correct. 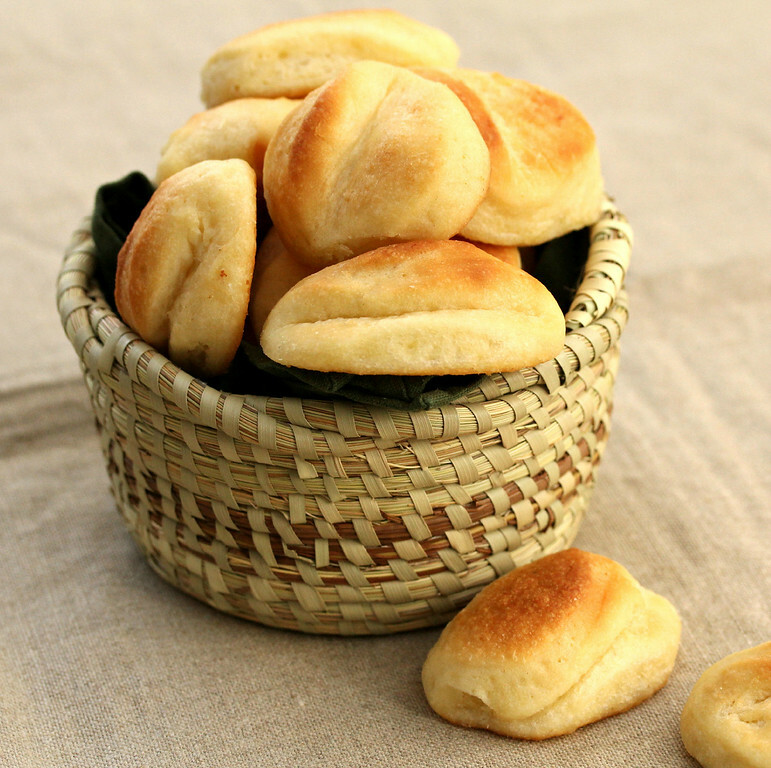 Yeasted rolls that must be baked and then served hot. The big trick was to make sure I got the timing right. These rolls worked out beautifully!!!! The recipe calls for the dough to be mixed at least one day, and up to one week, in advance. 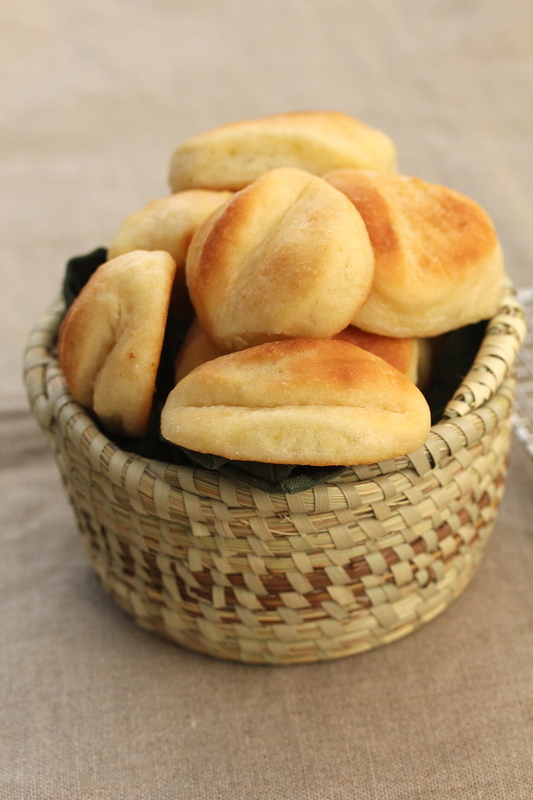 The dough is unusual in that it is almost batter like when you mix it, but it emerges from the refrigerator like biscuit dough or cookie dough. It's pretty amazing how this recipe works out. The rolls are like a cross between light and airy rolls with the flavor of biscuits... plus butter.... it's really hard to explain. You must try these. I've been using the leftovers to make "turkey and stuffing sliders." Soooo good. Yield, approximately 24 rolls. Adapted from Paulchen's Kitchen, adapted from The Glory of Southern Cooking by James Villas. Place the yeast in the lukewarm milk and let it sit for five minutes or so. Cream the shortening, butter, and sugar in the bowl of a stand mixer using the paddle attachment. Slowly add in the boiling water. Add the yeast and milk mixture, continuing to mix. Grease a half sheet pan. Turn the dough out onto a lightly floured counter, lightly sprinkle the dough with flour, and lightly coat a rolling pin with flour. Roll the dough out to a scan 1/2 inch thick. 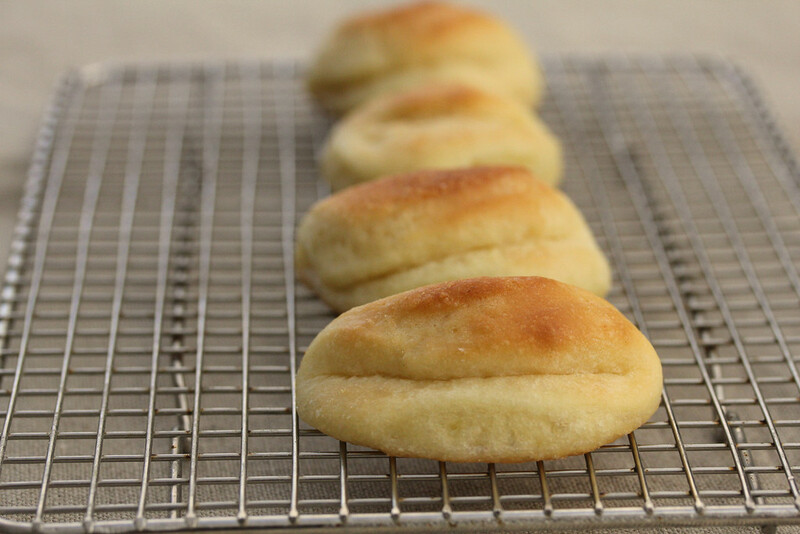 Using a 2 1/2 inch round biscuit or cookie cutter, cut the dough into rounds and fold each round in half. Place each roll onto the baking sheet. Generously brush the rolls with butter. Cover the baking sheet loosely with plastic wrap and a towel. Set aside to rise for about 2 1/2 hours. Bake in a 400 degree F oven for about 10 to 12 minutes. Serve immediately. Back story: This recipe is part of the Bread Baking Babes monthly bread baking extravaganza. Well, maybe not an extravaganza, but... well, click the link and read more. Once the Babes post the recipe, the buddies (that includes me!) can bake along with the Babes. Here is a round up of the Buddies' posts. 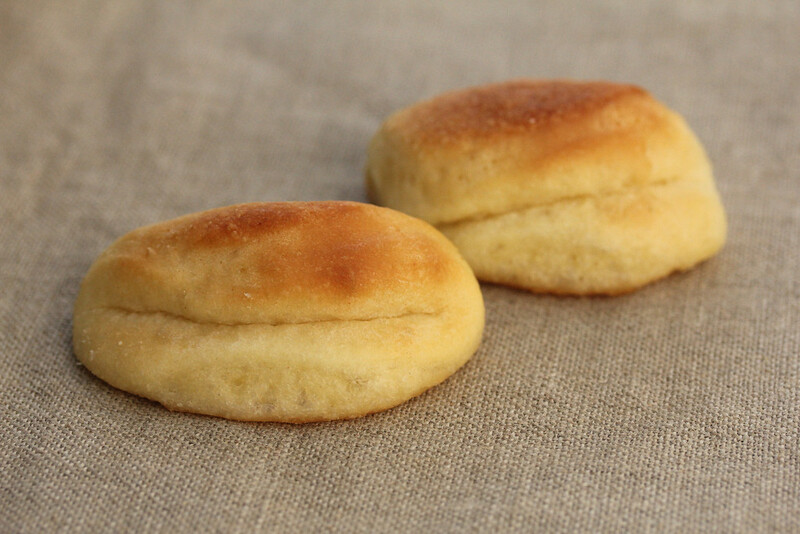 Many of the Babes think that these rolls look like lips. What do you think? Your pocketrolls looks absolutely perfect! Getting hungry, I need to try them .... Beautiful pictures too! They ARE like biscuits, aren't they? (And I thought it was just mine.) 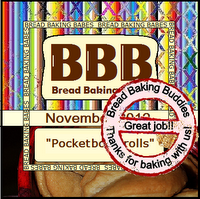 Your pocketbook rolls look lovely! Oh I think your family sounds just perfect! 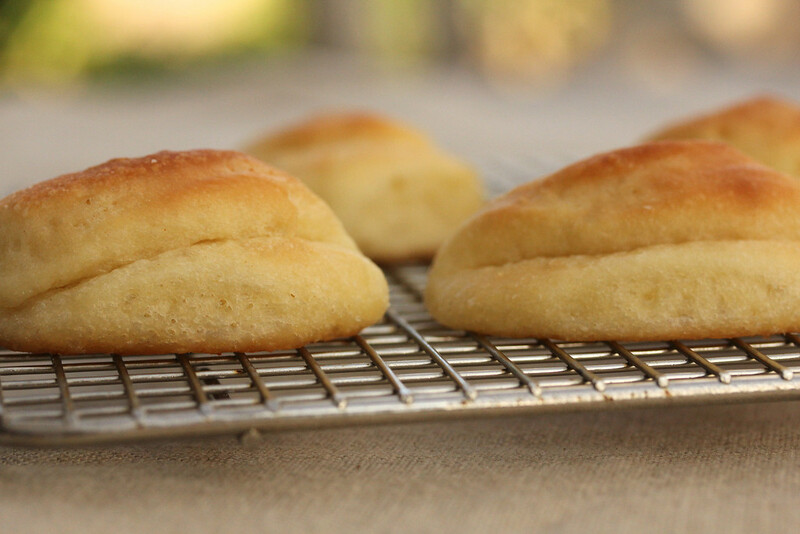 I found these rolls to be fabulously: do them the day before and bake when you need them. They were perfect for Thanksgiving. So delighted you baked with us. Thanks! They were almost like make ahead. So good. The suprise of the recipe revelation: the 16th is our BIG day! December has come, the countdown may start! Isn't this just "the perfect baking life"? Oh my goodness, I really like they way you style the already stylish rolls. Very pretty! Thanks for this recipe - I made some today, they are buttery, tender, delicious and therefore dangerously more-ish! I will definitely make them again.